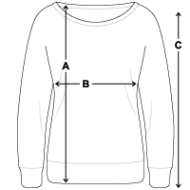 Women's Boat Neck Long Sleeve Top is in stock. We will print it as soon as you order it. Love the style of this sweatshirt. Feels good quality. The design on front is beautiful. Very happy. This is the second time I purchased the same one (just changed the design) simply cos I worn the first by wearing it too often :) quality is great!! Very comfy and doesn't change shape neither color after washing. I love the logo and colour but do think it’s a little pricey for a basic sweatshirt. Looking forward to wearing it nevertheless!